Can at-risk fish and hydroelectric dams coexist? In Portland on Monday, he holds what could be his last hearing in the salmon case, a final discussion of the government's third shot at a 10-year plan. He'll have to cut through the fog of fish numbers before handing down a decision with consequences for electricity ratepayers and farmers in four states. Helped by favorable ocean conditions and fishing restrictions, the numbers of salmon and steelhead returning to the Columbia have surged since 2001. Returns -- mostly hatchery fish -- hit post-dam-building highs for much of the past decade at Bonneville Dam, the first on an upstream journey that can run over eight dams and more than 900 miles. Redden's focus is narrower: the seven endangered or threatened wild runs that pass Bonneville, including 77 smaller populations native to tributaries in Oregon, Idaho and Washington. Their returns are also up sharply in the past decade, a promising sign after stark declines in the 1990s. But a closer look at the numbers shows key runs remain perilously low -- and well below minimum benchmarks for removing them from the endangered species list. Productivity in almost half the populations is still not enough for spawning adults to replace themselves with offspring that survive to make it home, crucial to long-term stability. And the uncertainty surrounding the numbers is strikingly high. Prodded by Redden, dam managers are increasing spill at the expense of power to draw juvenile fish downstream, ramping up spending on habitat restoration and strapping multimillion-dollar contraptions onto dams to help young fish get past them alive. They predict the newest plan will strengthen the runs and move them closer to escaping the endangered species list. Yet the details of the government's more aggressive plan indicate that Redden, who has warned dam managers against "treading water" for another decade, will still have to make a leap of faith to approve it. To get a sense of what it took to harness the mighty Columbia, it helps to stand beside the open spillway gates at The Dalles Dam as spring torrents thunder past. The ground quivers. Water surges 15 feet high. Each second, 808,000 gallons pulse through the spill gates, enough to cover Portland's yearly water use in seven hours. The Dalles Dam debuted in 1957, part of a federal push from 1938 to 1975 that included 14 dams relevant to the case in Redden's courtroom: six on the mainstem Columbia, four on the Snake and four more on tributaries in Montana and Idaho. 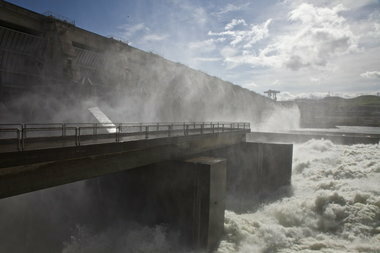 Dams provided juice for industry, helped lower electricity rates and made the Northwest the nation's hydropower king. Today, they supply one-third of the Northwest's power, all carbon free, and irrigate 8 million acres of farmland. Wild fish, already pummeled by fishing, logging, water withdrawals and urban development, paid a big price. Estimated wild returns to the Columbia and Snake before European settlement range from just under 9 million to 16 million, fueling a tribal culture that still revolves around salmon. In 2009, a good year, some 2.2 million fish came back. But most came from hatcheries; perhaps 400,000 were wild. Just over half the wild populations in the Columbia basin are extinct, researchers estimate. Many spawned behind dams that completely block fish, including three federal dams -- Chief Joseph and Grand Coulee on the upper Columbia and Dworshak on Idaho's Clearwater River -- and Idaho Power's Hells Canyon Complex, which isn't covered by the court case. Dams are far from the only culprit. Fishing and habitat destruction played a large part. So did hatchery fish, which compete for food and space and can interbreed with and weaken wild runs. But the dams converted 147 miles of stream-side habitat to reservoirs that slow the downstream trip and expose young fish to predators, from gulls to pikeminnow. Their fish ladders challenge adult fish. Their turbines and bypass systems churn young fish migrating to the ocean. By the early 1990s, wild fish dipped so low that Columbia and Snake runs began marching to the federal endangered species list. Basinwide, the list now includes 13 runs. Above Bonneville, seven of the 12 runs left are listed as endangered or threatened. Which brings us back to the courtroom. The lawsuit, filed in 2001, focuses on the National Oceanic and Atmospheric Administration Fisheries Service's "biological opinion." NOAA evaluated dam operations, looked at planned improvements in habitat, hatcheries and dam passage, studied fish numbers and concluded that the federal government's strategy wouldn't damage the prospects for recovery of wild fish. NOAA's work includes hundreds of pages of analysis to justify the conclusions. It has helped make Columbia basin fish among the most cataloged on the planet. And it includes a lot of good fish news of late. Average returns of all seven listed runs above Bonneville rose from the 1990s to the 2000s, sometimes dramatically, as ocean conditions improved. Returns spiked beginning in 2001, dipped mid-decade, then rose again in recent years, in part because of extra spill demanded by Redden. Last year, some 2,200 Snake River sockeye, not long ago largely given up for dead, made it to the Snake's Lower Granite Dam, up from single digits in the 1990s. Returns of the Snake's wild fall chinook surged to 10,113 last year, from an average of about 500 fish in the 1990s. Estimates of wild fish spawning also generally rose from 2008, when the Bush administration first laid out a new fish plan for Redden, to 2010, when the Obama administration updated it. That's the story federal agencies emphasize. After that, things get more complicated. For one, Snake River sockeye and fall chinook returns were helped by big increases from hatcheries, rising to 5 million fall chinook a year. Hatchery fish that spawn in the wild can provide badly needed short-term relief if they're genetically similar to their wild cousins. But they can be a long-term hindrance to getting fish off the endangered species list, which requires naturally sustaining populations. The number of fish actually hitting the spawning grounds to reproduce remains low, sometimes alarmingly so. Excluding Snake River sockeye, the average number of spawners in the listed runs tracked above Bonneville comes to about 21,000 wild fish, about 40 percent of the minimum 50,000 needed to get them off the endangered species list. In general, reproductive success dipped from 2008 to 2010, which NOAA blames on crowded spawning grounds. Besides sockeye, still at high risk of extinction, three large-scale runs are particularly worrisome. For Snake River spring chinook, four of 28 populations have fewer than 50 spawners, an important cutoff for extinction risk. 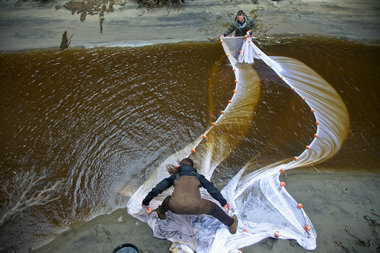 Spawners in offshoots of the famed Salmon River, a Snake tributary, are at 20 percent of minimum recovery levels, and estimates of their long-term growth dropped from 2008 to 2010. In the upper Columbia, four populations of wild steelhead spawners sit at about 40 percent of their recovery level. Worse: Their productivity, hampered by decades of poor hatchery practices, ranges as low as one adult returning for every 10 spawners. Wild spring chinook in the upper Columbia dangle at 20 percent of their recovery level as well, with a total of 861 spawners. The voluminous data are still sketchy enough that it's hard to pin down numbers with precision, including growth and extinction risks, particularly for a species prone to booms and busts. An example: Today, without accounting for new measures to improve their prospects, the government figures the chances of wild spring chinook in the upper Columbia going extinct in the next 24 years ranges from zero to more than 80 percent. Young salmon get tags sewn into their bellies to help with dam passage on Columbia River. (video) The Pacific Northwest is the hydropower king of The United States. Dams here provide us with a third of our electricity and irrigate our farmland. But since dam construction began in the 1930's, fish passage has been an issue. Today, at The John Day dam about 110 miles east of Portland, young salmon are having tags sewn into their bellies to help biologists learn more about fish passage. The federal government wants to convince Redden it's reducing those risks with aggressive actions and ample money. Recent and future dam improvements, habitat upgrades and other changes will eventually boost four-fifths of the populations studied into positive growth, NOAA's biological opinion predicts, with the rest improving to within shooting range. The Bonneville Power Administration, which markets power from the dams, has pledged $45 million a year for habitat from 2010 to 2017, double the spending of 2005, and millions more based on accords, signed at Redden's urging, with Northwest tribes and the state of Washington. That comes on top of more than $3 billion in operations and capital spending on fish-and-wildlife research, habitat and hatcheries in the last three decades. In coming years, BPA's direct fish-and-wildlife costs will account for up to 7 percent of a typical public utility customer's bill. The Army Corps of Engineers has spent $1.3 billion on fish passage improvements and research since 1994 and points to improvements such as fish slides or other structures now at all federal dams on the Columbia and Snake that swiftly route fish away from turbines. Juvenile survival on the migration downstream, particularly for steelhead, has improved in the past 12 years, NOAA studies indicate, and the new plan requires 93 percent to 96 percent survival of juveniles passing each individual dam. The latest federal plan doesn't spell out when the species will actually recover, but federal officials say that's reasonable for a plan that expires in 2018. Promised improvements will keep the fish alive while keeping them on track to recover, which meets Endangered Species Act requirements, government attorneys argue. If fish unexpectedly nose-dive, the Obama administration added "significant decline" triggers that could spark emergency actions, such as more dam improvements and studying removal of the four lower Snake River dams. The plaintiffs, including Oregon and the Nez Perce tribe, want to convince Redden that the plan leaves too much risk on the table. Given population growth and global warming's potential impact on the cold-water fish, their list of changes includes taking emergency actions now, spilling more water at dams, at least to levels Redden previously ordered, and setting riverwide survival standards, not just standards at individual dams. They also question the value of triggers set at levels near the dismal lows of the 1990s. The influential Western Division of the American Fisheries Society backs the plaintiffs. It called the Obama administration's update inadequate, short on concrete action if wild fish crash and dismissive of science that indicates the trauma of passing dams can kill juvenile fish much farther downstream. In a letter to attorneys last week, Redden said he wants to hear Monday about the uncertainty of habitat benefits, the extent of survival improvements required under the law, and the potential for more actions on dams. He was more sweeping in 2009: "Only recently," Redden wrote, have federal agencies "begun to commit the kind of financial and political capital necessary" to save the fish. "We simply cannot afford to waste another decade." 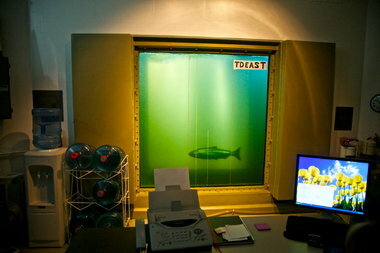 Salmon Wars Return to Portland Courtroom <-- Watch Video at original site.